Not much to like beyond the pictures of the place. Loved the property. The staff was wonderful, you felt like you where with family. It was an amazing stay, especially as a women traveling alone. Best massage of my life. Generosity of the staff and the quality of food. Property is so clean and located in a peaceful environment. I wish I could have lived at this property. It was gorgeous and the amenities were better than any hotel I have stayed at, or one that you would pay 3 times as much for. Cozy robes and slippers and so many products to use in the outdoor shower and bath. The architecture and design elements were so unique and the greeting with drinks and fruit and neck massage were a cherry on top. We were truly sad to leave. The Villa is huge and cleanliness. Staffs are friendly and helpful. Facilities in room is good. Breakfast is fabulous. We enjoy stay at the Aria Villa. 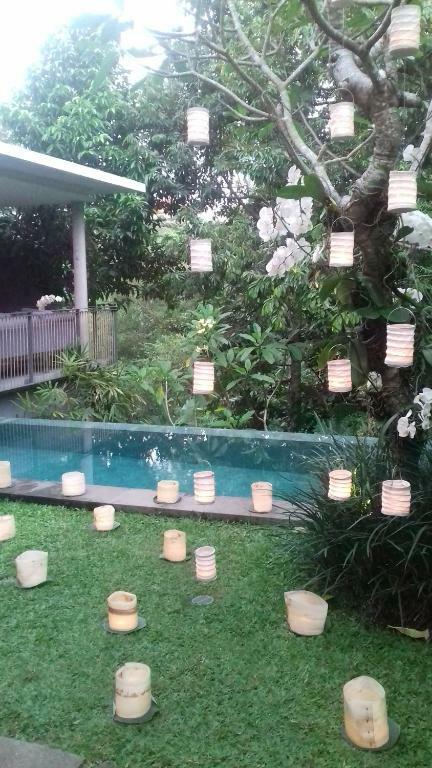 It was a great luxury villa, very clean, the staff were cheerful and so helpful the location is very near to ubud center and there is a free shutttle to get yoy there. Good contemporary design makes the villas very private and enjoyable with nice views into a green bush. Great pool and pool pavilion. Nice individual sun loungers. Fantastic bed, linen and towels. Nice bathroom & toiletries range. Fantastic breakfasts and good supply of fresh water. Very helpful friendly staff - we requested the same villa as last year. Location is good, very close to Ubud center. -the staff are all very friendly and helpful. Lock in a great price for Aria Villas Ubud – rated 9.2 by recent guests! Aria Villas Ubud This rating is a reflection of how the property compares to the industry standard when it comes to price, facilities and services available. It's based on a self-evaluation by the property. Use this rating to help choose your stay! 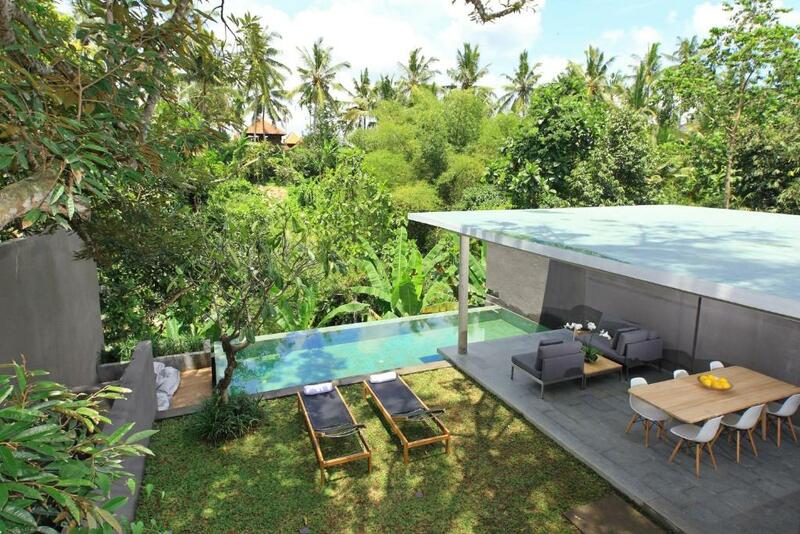 Combining modern designs with tropical touches, Aria Villas Ubud is set amid natural landscapes. It offers private villas with free Wi-Fi access and private pools overlooking the valley. Downtown Ubud is just a 5-minute stroll away. The property also offers free butler service. Featuring Balinese design and architecture, all villas are tastefully appointed with indoor and outdoor dining areas as well as cozy seating areas with plush sofas. Amenities include flat-screen satellite TVs, iPod docks and safety deposit boxes. Each air-conditioned bedroom has a private bathroom with a hairdryer, shower and an outdoor bathtub. 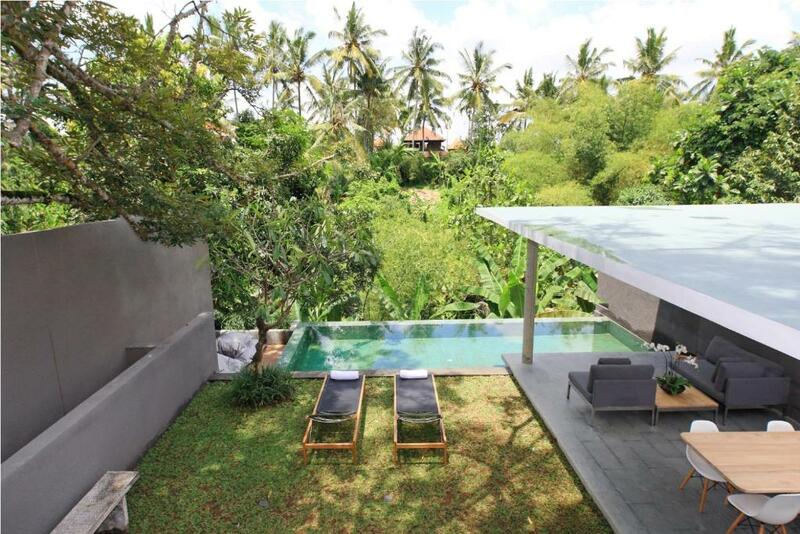 뀐 Located in the top-rated area in Ubud, this property has an excellent location score of 9.1! When would you like to stay at Aria Villas Ubud? Overlooking the valley, this one-bedroom villa has indoor and outdoor dining areas. Amenities include flat-screen satellite TVs, iPod docks and safety deposit boxes. The air-conditioned bedroom comes with a private bathroom with a hairdryer, shower and an outdoor bathtub. Offering better views of the valley, this one-bedroom villa has indoor and outdoor dining areas. Amenities include flat-screen satellite TVs, iPod docks and safety deposit boxes. The air-conditioned room comes with a private bathroom with a hairdryer, shower and an outdoor bathtub. Suitable for up to 6 guests, this two-story villa has indoor and outdoor dining and lounge areas. A well equipped kitchen is also available. Amenities include flat-screen satellite TVs, iPod docks and safety deposit boxes. Featuring comfortable interiors with natural materials and traditional Balinese accents, this 2-story villa has a well equipped kitchen, dining area and over-sized sofas overlooking the valley. Walkaways connect the poolside lounge area through a private courtyard to the spacious living area and bedroom on the upper level. A staircase leading to the lower level allows access to the other bedrooms overlooking the natural landscapes. Guests enjoy daily 60-minute massage for 2 people. Aria Villas Ubud is a modern private boutique villa development designed by Singapore - based architect, Chioh-Hui Goh, principal architect at studiogoto. The villas seamlessly blend design, luxury and an immaculately clean style with a firm environmental vision.Each of our 8 private pool villas have unobstructed views overlooking a lush green valley. Pool Villas are available with 1 or 3 bedrooms or a combination of 2 adjoining villas to create a 4 bedroom unit with 2 pools. A 24 hour front desk is available. We are all professional hotelier Team . House Rules Aria Villas Ubud takes special requests – add in the next step! Aria Villas Ubud accepts these cards and reserves the right to temporarily hold an amount prior to arrival. Please inform Aria Villas Ubud of your expected arrival time in advance. You can use the Special Requests box when booking, or contact the property directly using the contact details in your confirmation. Sadly, the villa must deal with neighbours. Here, neighbours incinersted their waste and the pungent smell of burning plastic etc. really affected what otherwise would have been a most perfect stay. Maybe the villa owners can take away the neighbours rubbish (for them) so they don't burn it. The villa fronted vegetation and not only was it secluded it was also very intimate. This villa is great in theory but not very practical. It looks good in photos but up close the materials aren't as luxurious as they set out to be. Be sheets had some stains. All toiletries were actually refillable. We unscrewed on of the conditioners to find gunk and hard residue around the twist top. The rooms are literally in nature and there is no netting from mosquitoes. If that's what you like then you would like this. Finding insects around your bed is common. And lastly its not so close to the center its a 10-15 mins walk. Not the best walk at night. We had a private pool but didn't use it once. Everythings perfect. Very freindly and beautiful place. Absolutely beautiful villas, beautiful outdoor shower and bath with exceptionally clean toilet facilities! Outdoor pool clean and with a great view! Not to mention the absolutely amazing service, we received a welcome massage and drink which set the mood for a stay full of relaxation! Whilst in the pool we also were given complimentary icy poles and we also came back to our room after dinner to find a small dessert which was delicious! We also booked a tour through reception and were given a 10/10 Balinese meal, the driver we had which they organised (Gusti) was one of the best we had on our holiday! Would definitely recommend going on the tours provided by aria villas and staying at this beautiful property! Super friendly staff, beautiful minimalist design, good breakfast selection and of course the location, center of ubud! Nice pool. Good breakfast. Staff was nice and helpful. Breakfast was awesome, staff were super friendly they shuttled us into the centre of ubud. The staff and the facilities were amazing. The pool was wonderful. The villa itself was quiet and private. We felt as though the structure of the villa wasn’t the best as there were many gaps on the sliding doors and bathroom door which allowed for lizards, ants and mosquitors etc to enter our room. The ants were everywhere, i’d wake up and find a new ant crawling on me everyday haha! The geckos kept us awake every night and it felt as though they were inside but we never knew! The TV had limited channels, we only had 2 english movie channels to watch however they did provide us with a DVD player and some movies to watch which was good. We loved breakfast being served to us every morning! The staff were very polite and attended to all our needs. The villa was beautiful and private and the sounds of nature were wonderful. The midnight snacks and complimentary popsickles were a treat!